Today the Four Roses Distillery is under construction but for a small fee one can meet Tobie and hear the story of how Four Roses came to be. Of course your nominal fee will get you a tasting of their products too. The construction will be completed in 2018, but they are hoping to be open in September of 2017 for tours. We all know that every distillery has a story, and the story of how Four Roses got its name peaked my interest. For this sappy romantic, the love story behind Four Roses resonant the most. Paul Jones Jr. moved his lucrative (bourbon) business to Louisville in 1884. Four years later he would name it Four Roses. So yes, for the romance... Mr. Jones falls in love with a southern belle and he asks her to marry him. She tells him that she will answer him at the Ball (yes back then they had Balls). She told him that if her answer is YES then she will let him know my wearing a corsage. So the night of the ball Mr. Jones goes to the ball to find that his love was wearing a corsage. The corsage consisted of Four Roses. Mr. Jones was so excited by the love of his life's response that he chose to name the distillery after the icon of their love. So sweet, almost as much as their small batch bourbon. 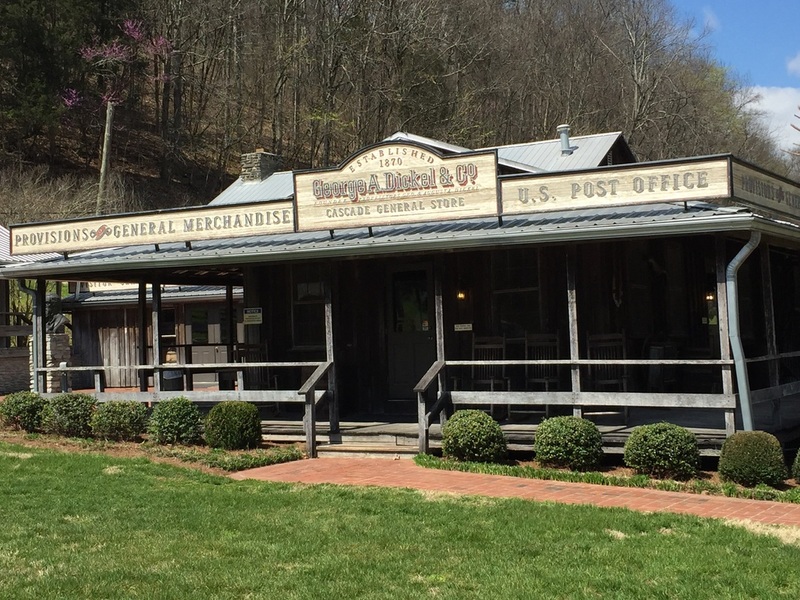 Be sure to check out the distillery in the fall and get the rest of their story. Stranahan’s is very near and dear to my heart. Having over 50 bottles of this great whiskey in my collection, is no surprise to those who appreciate good whiskey. 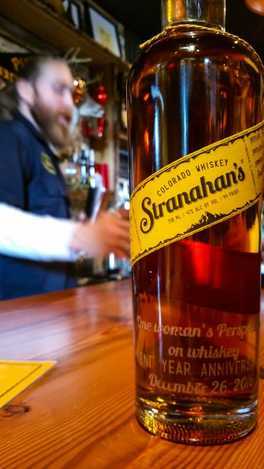 Stranahan’s is a small batch whiskey that varies in each batch they make. No two batches are exactly the same, which is why I tend to go on scavenger hunts to try and find my favorite batches and stock up for those special occasions. Stranahan’s story is unique in a way that brought a fireman and a farmer together. When Jess Graber showed up to his neighbor’s barn to put out a blaze a friendship was built and Stranahan’s was born. The two came together and developed a recipe for a whiskey that will forever be this fan’s favorite. Location of this great distillery is on the outskirts of Downtown Denver. Since batch 066 I have been visiting this distillery watching their progress. Not only have I made friends at this distillery but I brought many people there as well to see how fantastic this operation is. Throughout the years that I have watched this company grow a number of new products have developed. Starting with their Snowflake product that is now only released once a year in December. This product is finished in wine barrels from local wineries around Colorado. A must have for me is when Stranahan’s combines forces with Balistreri. Not only do we get a great snowflake product Balistreri will produce some great wines with the Stranahan’s flavor as well. One that I have recently got my hands on is the Port and soon to be released will be their cherry wine. Next there is their Diamond Peak product that is a combination of barrels that are aged for four years. This product is a fantastic sipping whiskey and truly a fan favorite. Since this product is fairly new to the market one can find batches that are in the lower numbers such at 006. Then there is always the Stranahan’s Colorado Whiskey small batch with the yellow label. The earliest batch that I have in my collection is 023. My favorite batch that you can still find on the shelf today is batch 165. Of course there are other batches that are in my collection but they can’t be found on the shelf in today’s market. Another interesting notion is that Stranahan’s is working on, which is not new to the market but new to them, is allowing liquor stores to come in and choice their own barrel to be bottled for their store. Now if I can just get them to allow me to go in and choose my own barrel to bottle just for me. One other note I would like to add is that Stranahan’s has recently restarted their distribution to other states across the United States. Last post I saw was they made it to the French Quarter in Louisiana. So cheers to all of my fans across the US and hopefully if Stranahan’s isn’t there it might be coming to a liquor store near you soon. George A Dickel Distillery has quite the operation and I am very proud to stay that the head distiller there is a woman! Julie was a great tour guide and explained the process of making their fine spirits. Most of us were impressed to hear that George knew the best time of the year to make whisky was in the winter so they created a charcoal filtration process that is chilled to make the best whisky all year round. I would love to taste that whisky chilled right off the line. 80% of their used barrels go to Johnny Walker for their Blue recipe. What a great partnership to have there! Orphan barrels that were found are being processed and bottled at this location. Keep your eyes out for those. Once they are gone, they are truly gone. This is a great tour and I highly recommend it to everyone. Tell Julie I said hello! 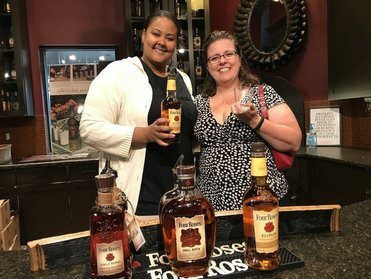 If you plan on pursuing the Kentucky Bourbon trail, I recommend that you slow down and take a look at some of the distilleries off the beaten path. There was so many distilleries to see that we will have to make a return trip ourselves, to attend them. While we were there we got to see some interesting processes and taste some great spirits. Markers Mark is a jaunt south of Louisville, but very worth the drive. Makers is currently owned by Suntory. 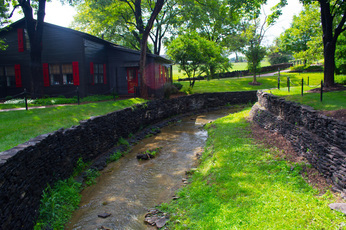 In the 1930’s, the Samuels purchased a small distillery for $35,000, that small distillery is now known as Makers Mark. Every bottle that you see in a store in any part of the world is made at the distillery in Kentucky. Each batch is made with 26 barrels that includes ingredients of 70% corn, 16% winter wheat and 14% Barley. The secret ingredient of course we all know is in the water which comes from a limestone lake. The yeast that they use in their mash is 150 years old. Their fermenting barrels are made from a Cyprus wood (picture below of this greatness). Their labels are made from a 1937 printing press that they still use today that one woman operates and cuts. They have 35 warehouses that are rotated by hand. Bottling is done by taste not by age, but with that being said the average age of the whiskey in a barrel is six years. Bottles are cleaned with whiskey (my favorite part), and bottles are dipped by hand by the employees of the distillery. Twenty-three to twenty-seven bottles can be dipped per a minute. The employees there are amazing to be able to do that many that fast. I dipped my own bottle and the process took me 15 minutes to make sure that I was able to do it right. The branding on the bottle is the brand that the Samuels used when they were farmers (very similar to the Wyoming Whiskey story). A highlight to this tour was learning about Marks Mark 46, and how great this spirit truly is. Markers Mark 46 was started in 2010 by Bill Samuels. 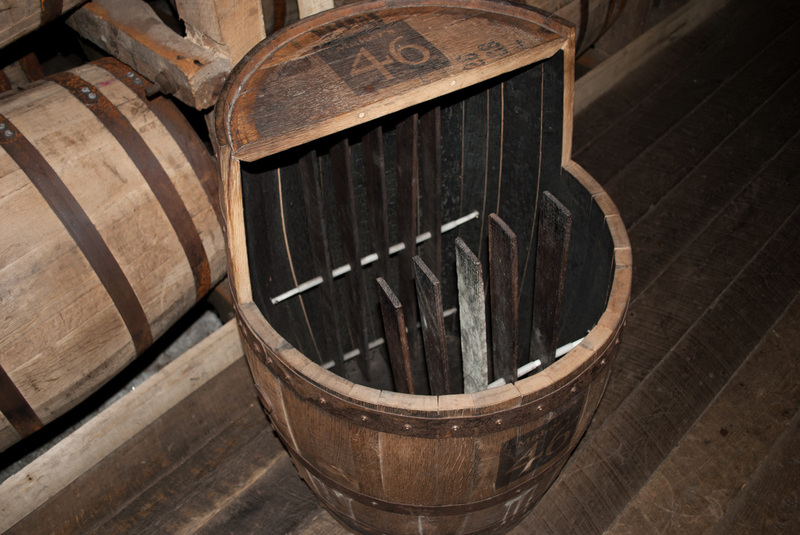 He wanted to try something different so he took the original recipe from Makers Mark out of a barrel and added ten additional seared staves into the barrel (picture below). He then added the original Makers Mark recipe back to the barrel and let it age for additional ten weeks. The idea here is that there is more surface area that the whiskey is exposed to, giving the whiskey a unique taste. Mr. Samuels still goes into the distillery every Thursday to sign on the Makers 46 bottles that you can purchase at the distillery. Highly recommend everyone to check out this distillery. Beautiful grounds alone that will draw you in. See my gallery for more awesome pictures taken by Samuel Breadon.